Before Pelosi and her fellow Democrats turn down the road to impeachment, they might do well to listen to the last speaker of the House who tried to remove a president. If Democrats are trying to reassure anyone that they won't impeach President Trump, they aren't doing a very good job of it. We're waiting to see what the special counsel finds," Rep. Jerrold Nadler, who will run the House Judiciary Committee, told CNN. "And we will then have to make judgments. I certainly hope that we will not find the necessity for an impeachment. But you can't rule that out." 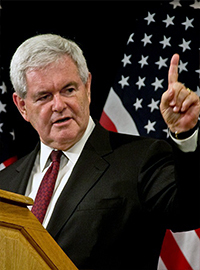 Gingrich's words — and McConnell's, too — are extraordinary admissions of mistakes. Together, they serve as a warning to Democrats to be cautious when it comes to impeaching Trump.